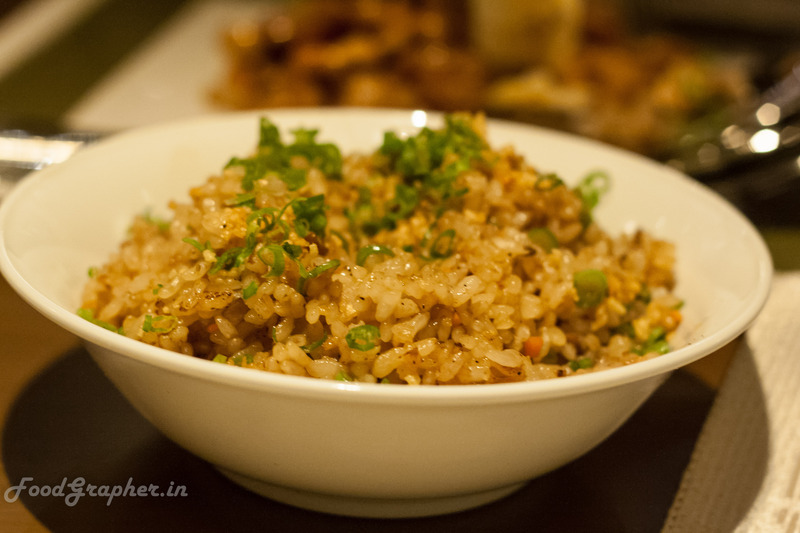 When you hear that the cuisine at a restaurant is Asian, a very few dishes come to your mind. 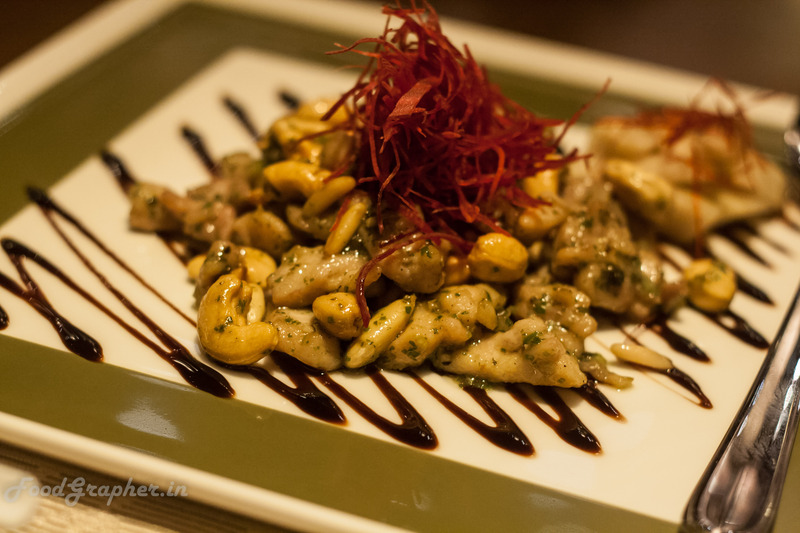 I too had the images of usual meat balls, schezwan noodles and fried rice but in better versions and style since I was heading to ITC Grand Chola’s Pan Asian. But lo, I was in for a total surprise. Let me begin with the decor. 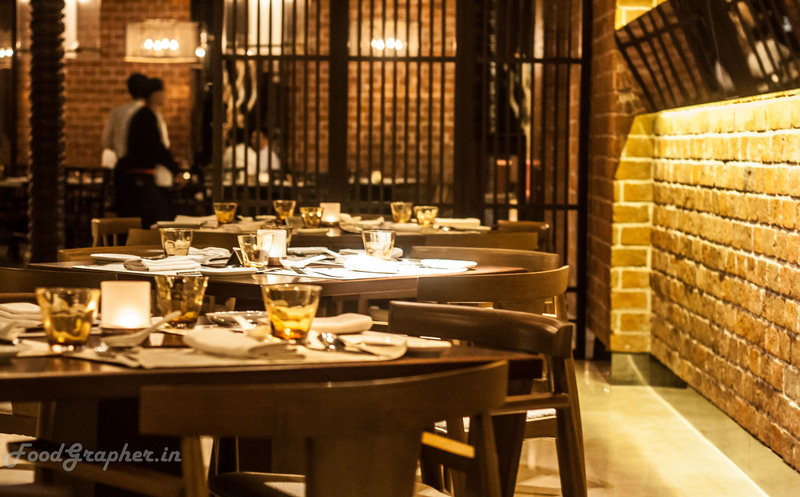 The decor is simplistic, walls have that bare brick style, and seating areas look segmented. 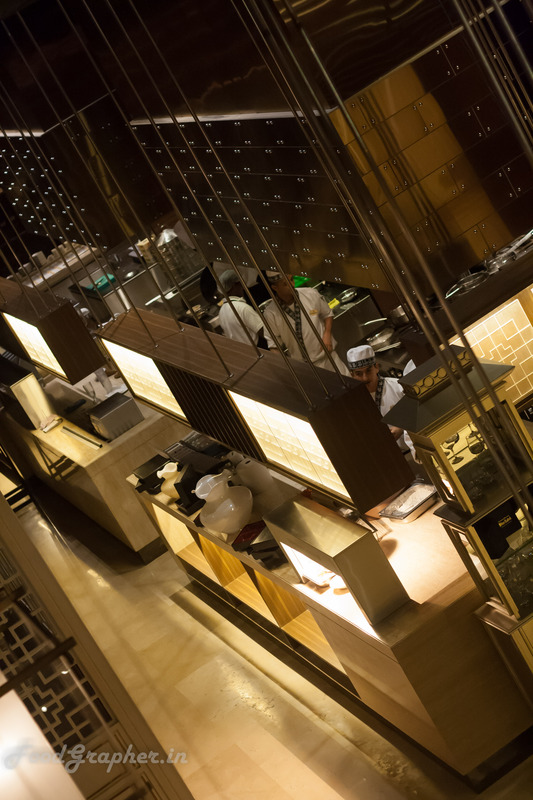 As you enter the restaurant, you are welcomed with a realy long row of wine collection which leads you to the bar, and cold storage showcases. Then we split ways to the dining areas spread across the lower deck. Its an open kitchen setup with a seperate dessert studio. 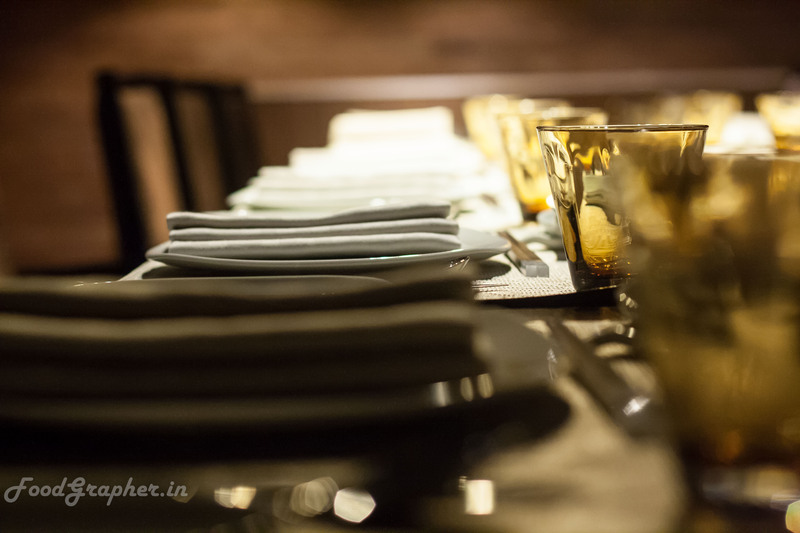 Upper deck does not have dining area, it has a champagne lounge and a Chef’s Table (did you know that we have very few of these all over the Chennai city?). Ambiance is quiet & cozy. And yes, those empty frames on the walls are not incomplete works. I’m told that the frames there are left empty so as to break monotony for the patrons. 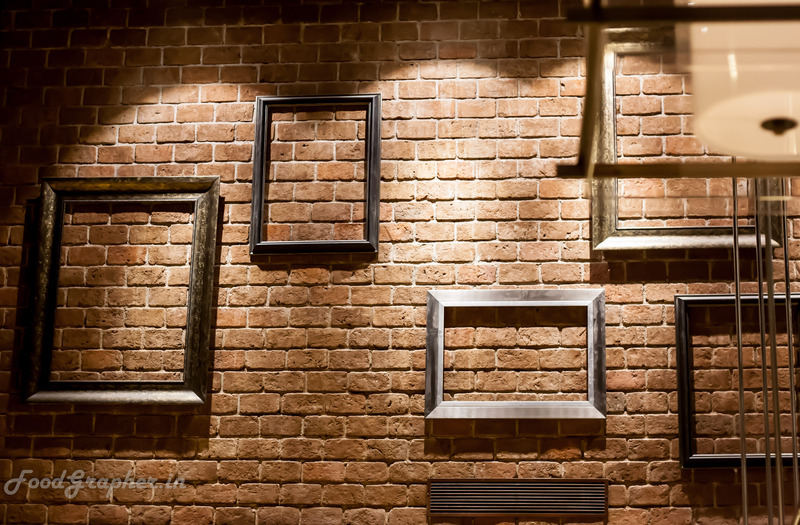 Every time you are there, you can imagine pictures of your own filling up those empty frames. 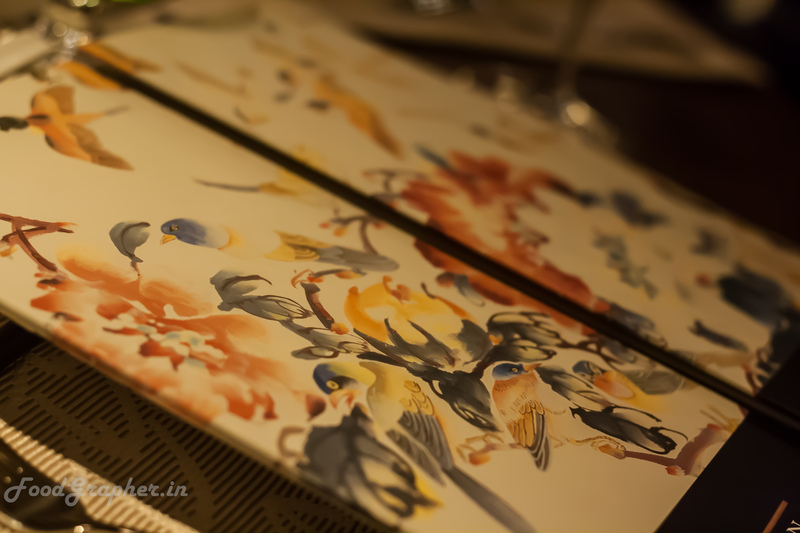 The cutlery, plates, and even the menu has designs of sparrows on them, which is an Asian symbolism. Let us now move onto food, shall we? Starting off with Amuse. 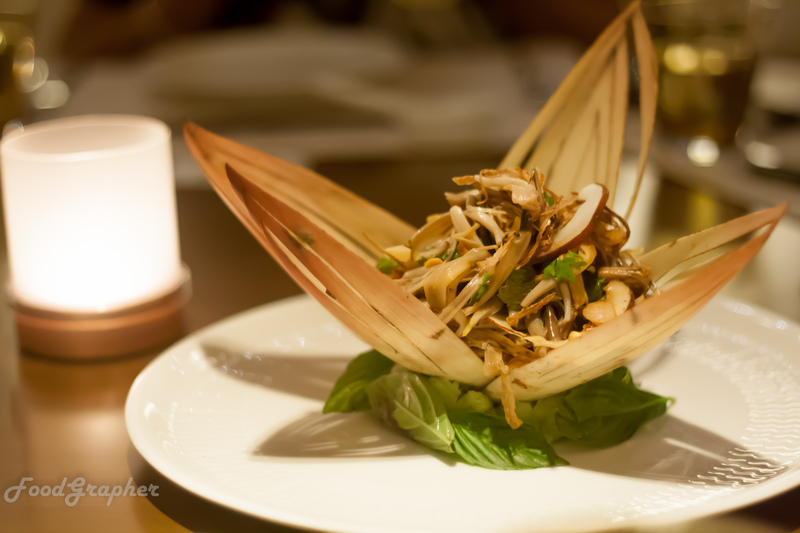 First to arrive was the Banana blossom salad. 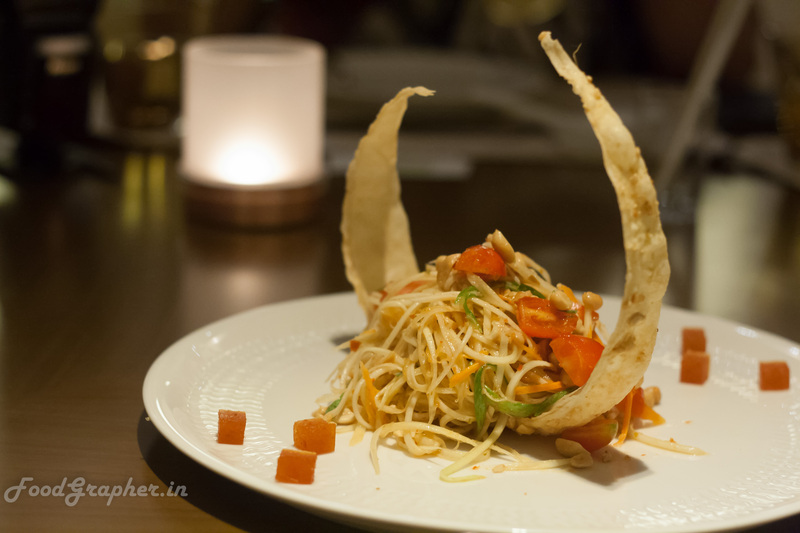 I have had south indian banana blossom dishes, but this one was quite a big surprise for me. Next was the steamed duck carpaccio. 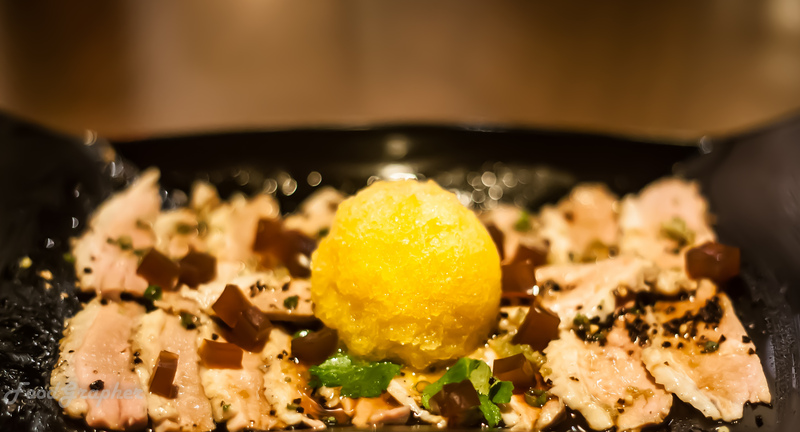 With the orange ice’s tanginess, chewing on the thin slices of steamed duck was delectable. And then came Som tam. This is chef’s take on the classic thai salad. 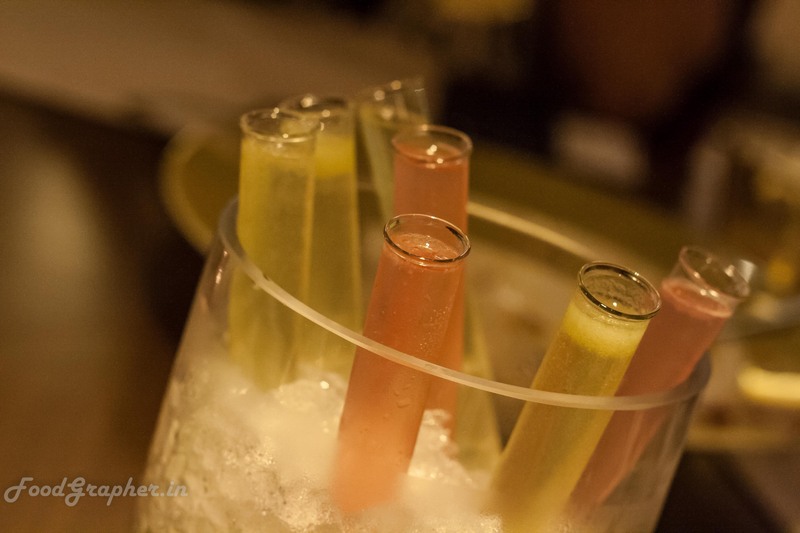 Was presented in a interesting way and tasted interesting too. Even before I got done with this, my eyes were hooked onto the very peculiar looking prawns. 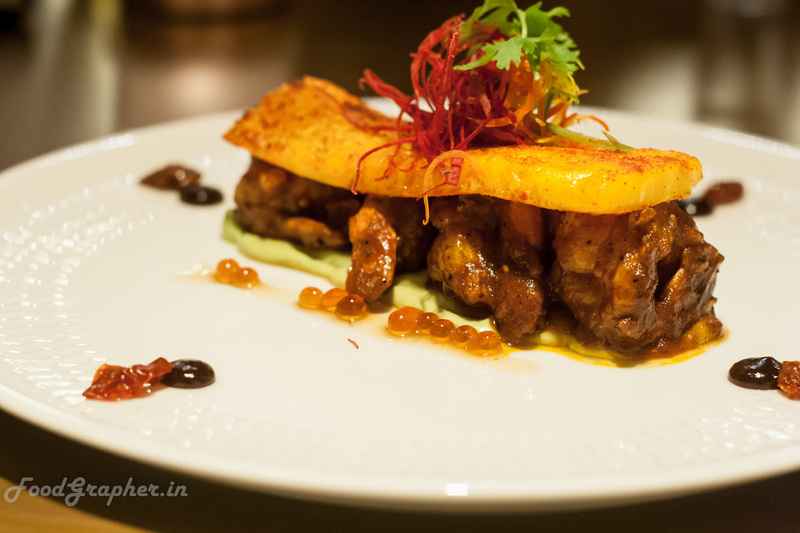 Yes, that is the Sichuan style crispy prawns done with nut sauce and avocado, covered with a slice of spiced pineapple. 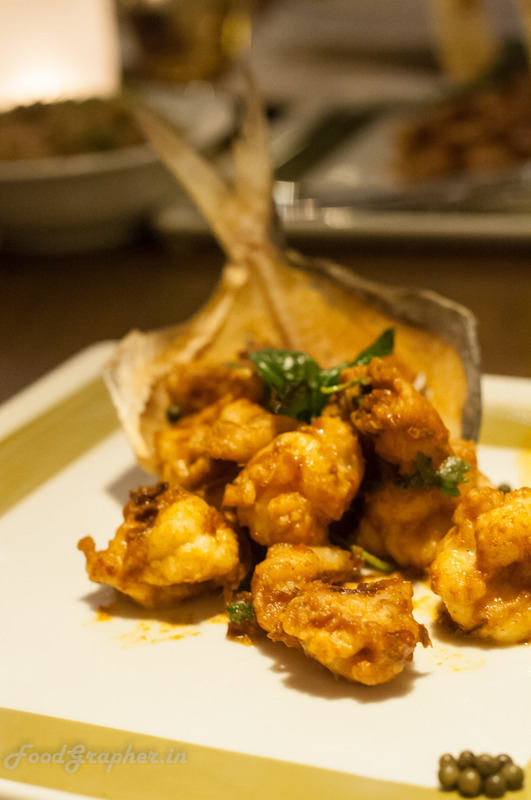 Hailing from the coastal regions, I love my seafood and this was delicious.So was the Phad cha talay, which had an assorment on seafood cooked with turmeric and basil, presented on top of a curvy fish slice. Delicious seafood didn’t stop there. 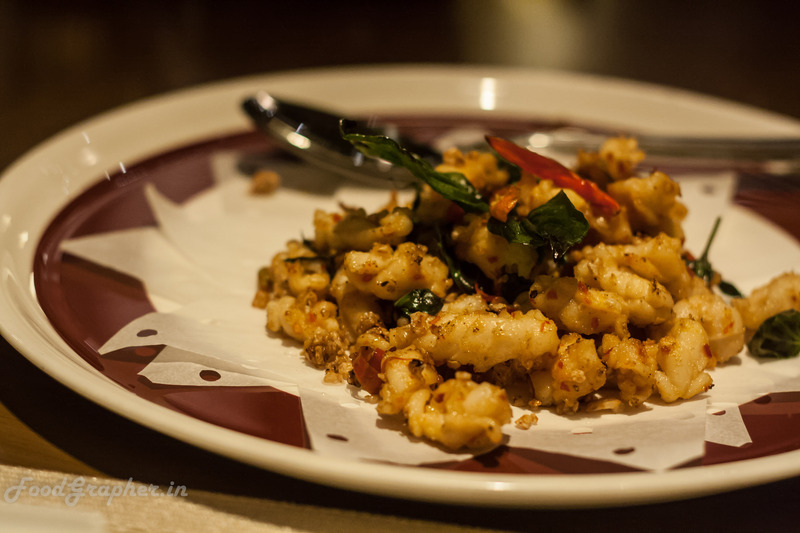 Stir fried Squid was rightly done (squids are very tricky). 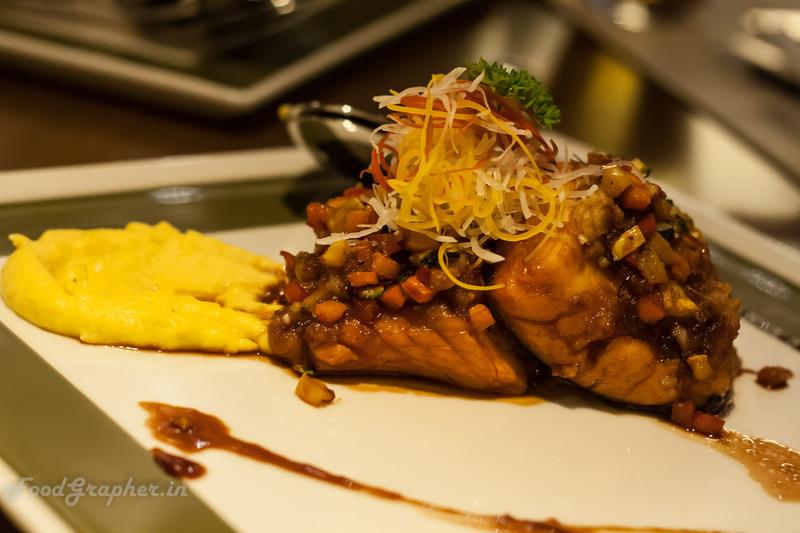 And I couldn’t stop with just one helping of Tamari glazed salmon. 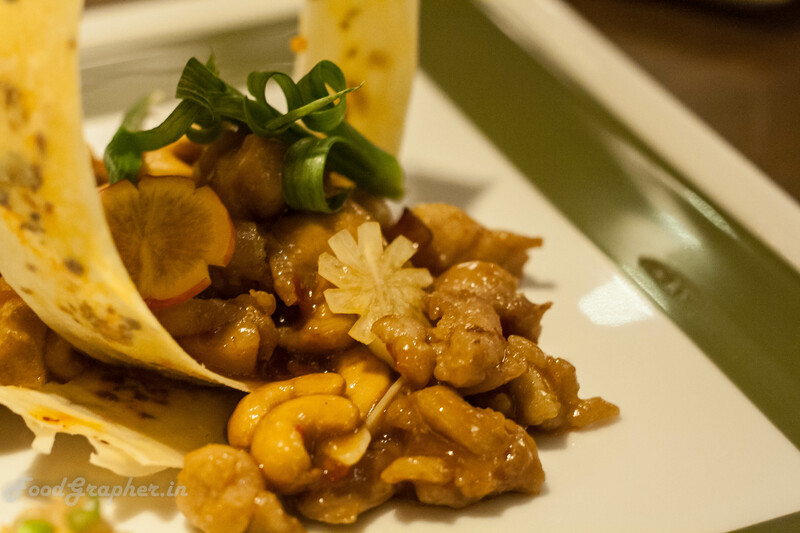 We were served Wok tossed chicken and Chicken gaobao with pixian chilli. Both the dishes were yum and vanished off quickly from our plates. 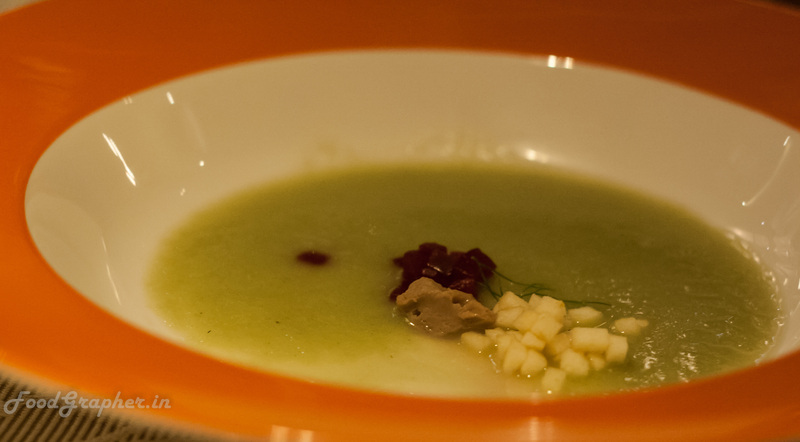 Some where in between these dishes, I had my first yummy hot apple soup, Californian apple and fresh fennel soup. And the way it was served was also different, or may be was a first time experience for me, right out of a steaming kettle, on to a big flat bowl-plate. And now comes my favourite of the lot, Desserts!! Spearmint ice on the Vahlrona chocolate was amazing. 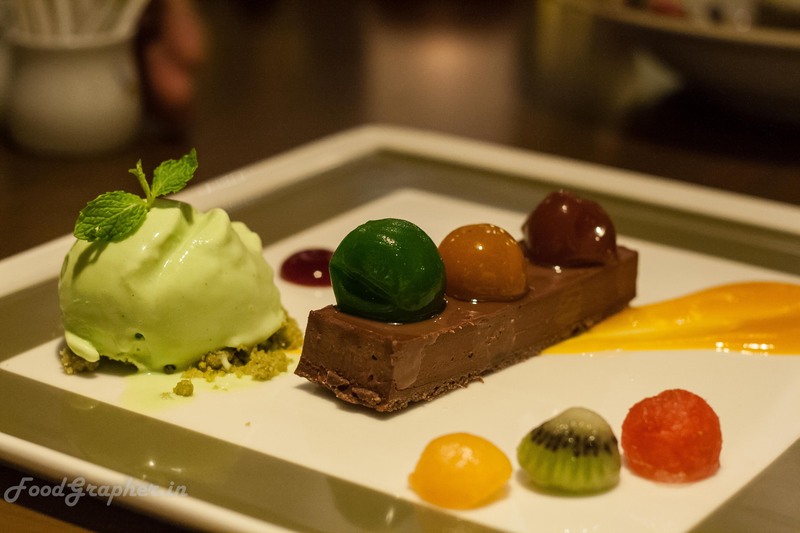 Pan Asian dishes out some amazing flavours of ice cream off their dessert studio. Then comes Chef’s special, Serenity on pebbled path. 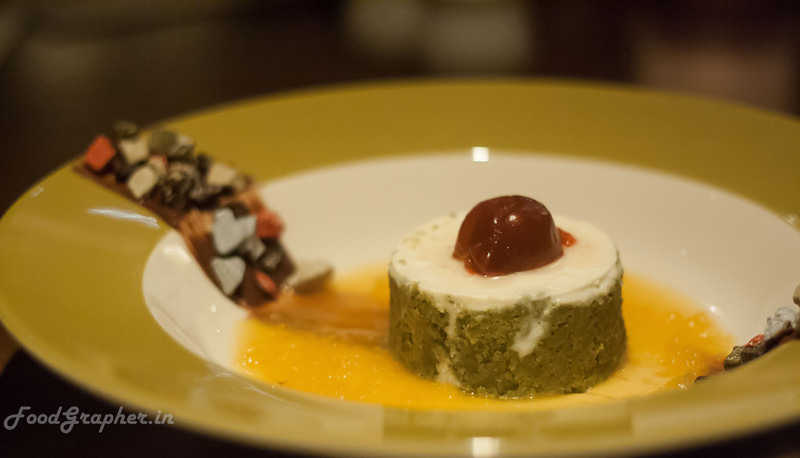 This dessert is a story in itself. And we washed it all down with some non-alcoholic shooters. Menu here is extensive, with sections of chinese (four regions at that), japanese and rest of asia. 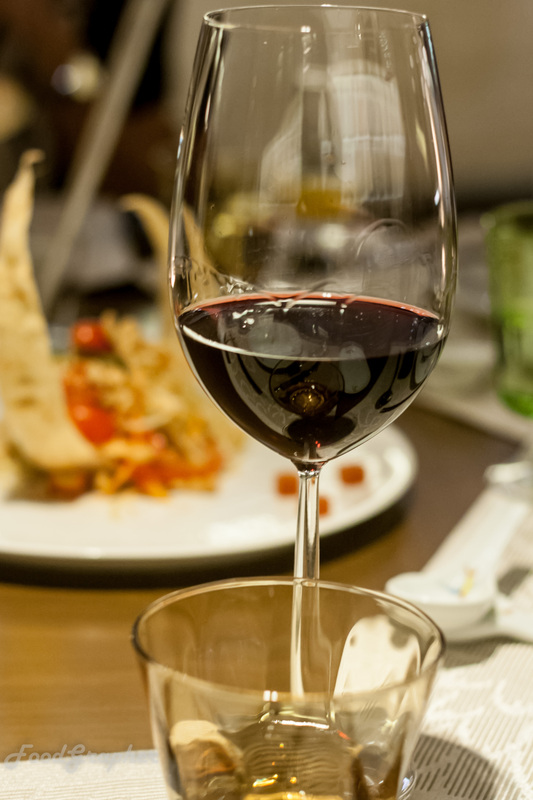 Meal for two can easily drain your wallet by 4k-5k (not including the wine), and the Chef’s table starts from 6.5k(per head). 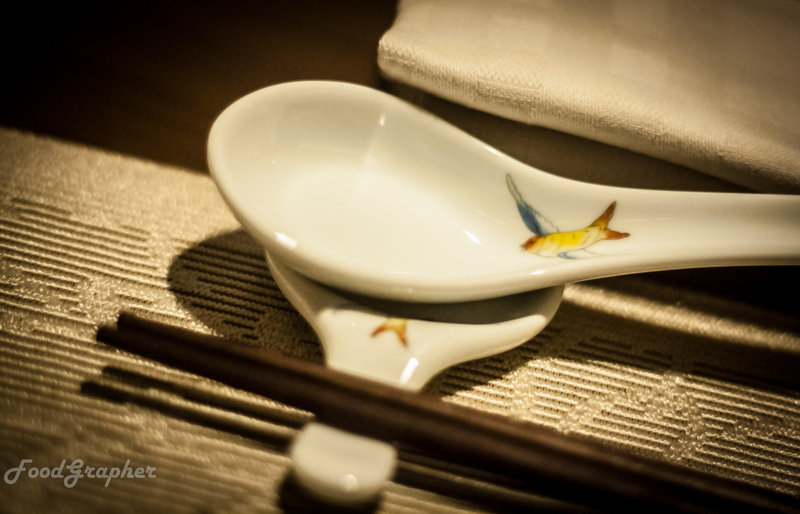 It is an experience in itself to dine here devouring the Asian delicacies. 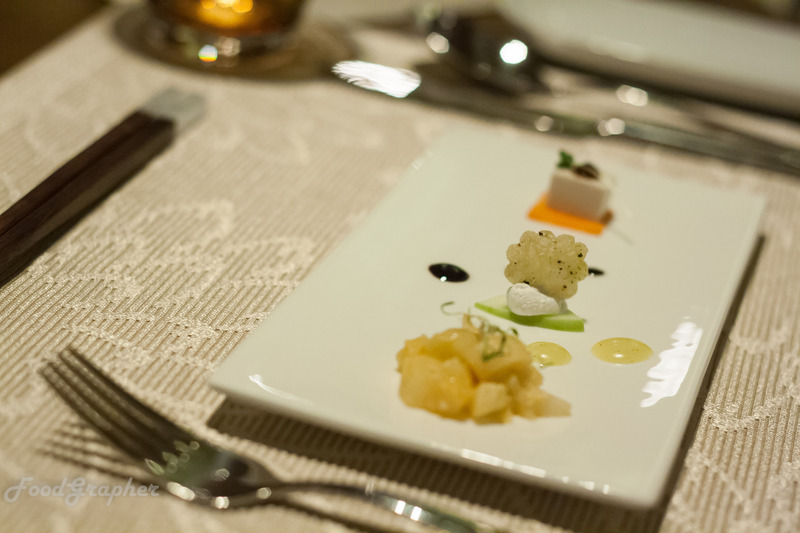 This entry was posted in Asian / Pan Asian and tagged Banana blossom salad, duck carpaccio, galzed salmon, ITC Grand Chola, Pan Asian, sichuan style crispy prawns, som tam, vahlrona chocolate. Bookmark the permalink.